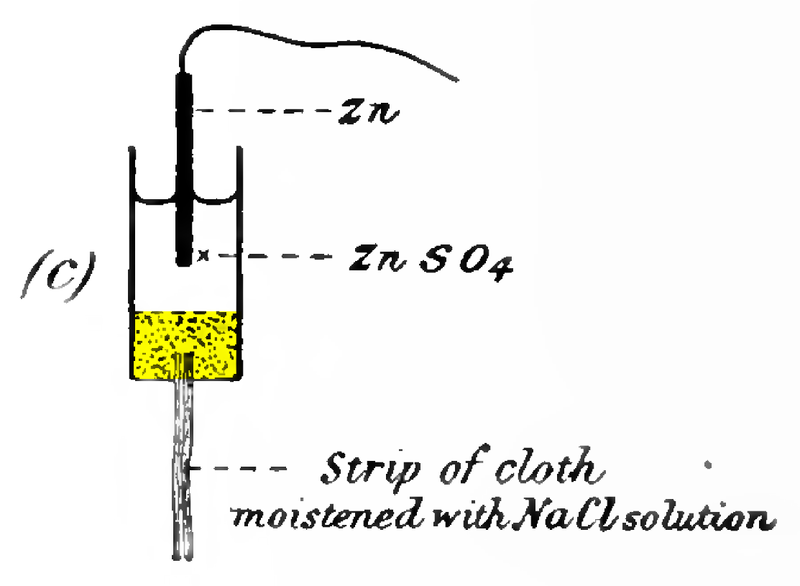 On Diagram C, one will note that he uses a strip of saltwater soaked cloth attaching to a node that contains, what appears to be, a Zinc Sulfate solution with a Zinc rod resting in this ZnSO4 solution. Below the ZnSO4, there's a seemingly unspecified area that acts as an intermediary between the ZnSO4 and the "strip of cloth." I have highlighted it in yellow in the diagram below. Could someone please explain what this medium may be or what could be used in it's place? It appears to be some kind of solid or interstitial porous material (or another compound that he does not mention). Or is it simply a generic attachment or some kind of neutral absorbent material (perhaps sand?) that acts as a medium between the Zinc Sulfate, the "node" and the moistened cloth? Browse other questions tagged electrochemistry chemical-biology electricity or ask your own question. Clarification about Frost diagram y-axis conventions?